Insects are some of the most accomplished and aerobatic of all flying animals, possessing the ability to take off at a moment’s notice, make rapid but highly-controlled turns or detect and avoid obstacles that appear in their flight path. Even more impressive is that some insects, such as honeybees and orchid bees, achieve all of this while navigating over vast distances between a food source and their hive. The capabilities of flying insects are remarkable not only because flight is arguably the most challenging of all forms of animal locomotion but also because insects are able to master it using miniaturised brains and sensory systems. To fly, an animal must be able to control the translation and rotation of its body along three axes and do this despite the constant movements of the air, which may suddenly and unpredictably change direction and speed. A further challenge is to control flight in a way that allows the sensory system time to detect and avoid unintended changes of course or collisions with nearby obstacles. While modern aircraft face the same challenges, the human solution has been to develop multiple technologies – such as laser, sonar and GPS – that allow pilots to measure the speed at which the aircraft is moving relative to the ground and its altitude as well as the position and motion of nearby obstacles. Such luxuries are not available to insects, so how are they able to fly and navigate safely through the natural world? Research over the past few decades has demonstrated that flying insects rely predominantly on visual information for flight control and navigation. If you remove visual information by painting over their eyes, or putting them in a completely featureless environment, insects will not fly. This suggests that, despite their extremely limited stereo-vision and fixed-focus optics, flying insects can extract sufficient information from their visual environment to be able to control their flight. Figure 1: A view of the typical experiemental setup used to investigate how insects use vision to control flight. 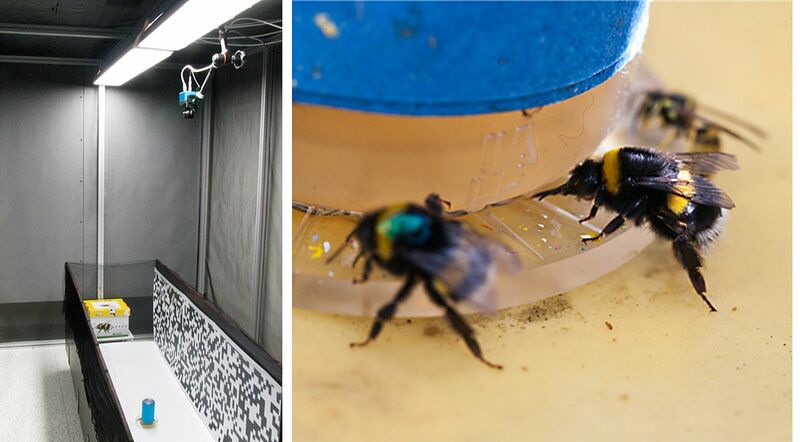 In this case, we have used bumblebees from a commercial hive (yellow box) and trained them to collect sugar water (above) from a feeder (marked in blue) placed in the centre of an experimental corridor. A high speed camera mounted above the corridor allows us to record the flight trajectories and to analyse the effect of different visual manipulations on flight control behavior. In my research, I try to understand how flying insects use visual information to control flight, avoid obstacles and, ultimately, navigate successfully through the natural world. One of the most efficient approaches to avoiding obstacles is to make sure that the visual system has time to detect and avoid potential collisions. Thus, the more cluttered the environment, the slower an insect needs to fly. But, due to the limitations of their visual system, flying insects cannot measure directly the speed at which they are moving relative to the ground, yet they are adept at avoiding collisions when flying around leaves and twigs when searching for flowers in bushes. To investigate how insects use vision to control flight speed, we trained honeybees to fly along a corridor (Figure 1) and manipulated the visual information on the walls. By moving the pattern on the walls either with, or against, the direction of flight, we manipulated the apparent speed of motion that the bees would experience when flying along the corridor. When the apparent speed of motion was decreased (when the pattern moved in the direction of flight), the bees would fly faster and when the apparent speed of motion was increased (when the pattern moved against the direction of flight), the bees would slow down. When we measured the retinal velocity of the pattern of the eyes of the bees in each condition, we found that it remained remarkably constant, suggesting that the bees were regulating their speed by holding constant the speed at which the world passed their eyes. Because the apparent speed of obstacles increases as their distance from the viewer decreases – to envision this, think about the relative speed of signposts on a road compared to clouds in the sky when you look out of the window of a moving car – this strategy ensures that the bees will automatically slow down when flying in a cluttered environment without requiring them to perform any calculations about the true distance to the obstacles. 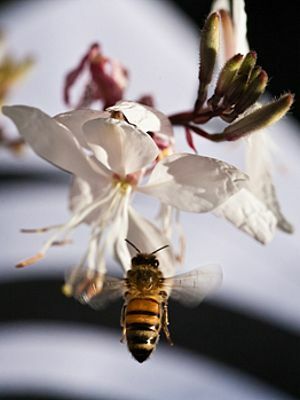 Figure 2: A honeybee landing on a flower. We investigated the visual cues that honeybees use to control their speed when landing on vertical surfaces by rotating a spiral pattern (background). We found that, to land safely, honeybees hold constant the rate at which the image of the landing surface moves across the eye as they approach it. This is a simple strategy that automatically ensures that flight speed is reduced to near-zero when the bee comes into contact with the surface. 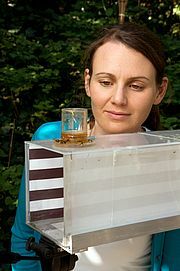 This principle of using the pattern of apparent motion to extract information about the three-dimensional structure of the environment turns out to be one of the most fundamental for insect flight control. By changing the visual motion that bees experience when flying along a corridor, or when landing, we have been able to determine the strategies that bees use for regulating their position when passing nearby obstacles and when landing. Although we now understand much more about how flying insects use vision to control flight, we still know very little about how the visual habitat of these insects shapes these behaviours. Flying insects inhabit a broad spectrum of visual environments, from the dark, densely cluttered tropical rainforests to the open, featureless expanse of the Australian desert. Even more remarkably, flying insects are capable of navigating through these environments despite the large and often unpredictable changes in spatial composition, obstacle motion (caused by wind) and light intensity. The goal of my current and future research is therefore to understand how the visual environment shapes the visually based strategies that insects use to control flight and navigate. This research will have implications for not only understanding how visual information is processed in miniature brains but also for the development of lightweight, efficient guidance systems for small autonomous robots.